We present a method of constructive induction aimed at learning tasks involving multivariate time series data. 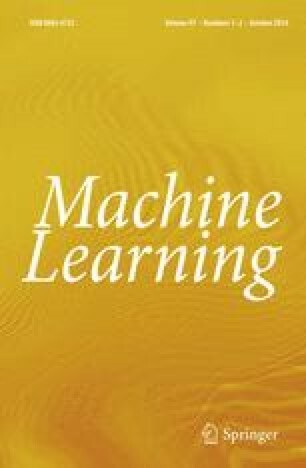 Using metafeatures, the scope of attribute-value learning is expanded to domains with instances that have some kind of recurring substructure, such as strokes in handwriting recognition, or local maxima in time series data. The types of substructures are defined by the user, but are extracted automatically and are used to construct attributes. Metafeatures are applied to two real domains: sign language recognition and ECG classification. Using metafeatures we are able to generate classifiers that are either comprehensible or accurate, producing results that are comparable to hand-crafted preprocessing and comparable to human experts. Statsoft (2002). Electronic Statistics Textbook (http://www.statsoft.com/textbook/stathome.html). Tulsa, OK: Statsoft.